This is it folks ! 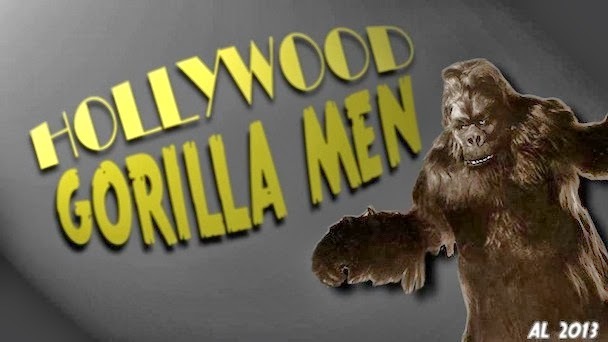 This will be a step by step guide to creating your own "Classically Styled" gorilla suit. This won't be a Rick Baker suit you can't tell from the real thing, but more along the lines of Crash Corrigan and Charlie Gemora. There will be several routes to take with this process, and we'll try to cover them all. In this first instalment, we'll take the simplest route. 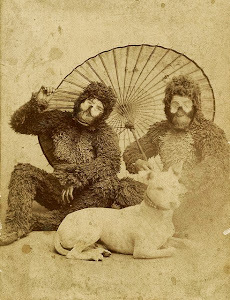 We'll modify an off the shelf costume. 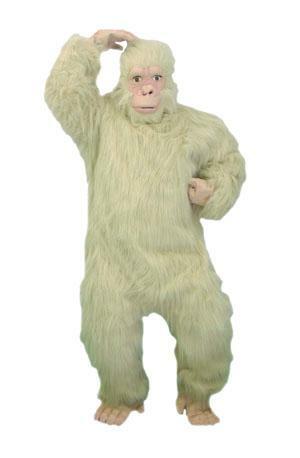 This is the "beige" gorilla. I'm using a light colored suit, as it photographs much better to demonstrate the steps. 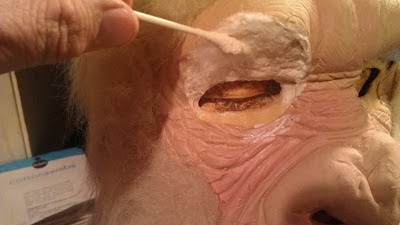 This demo will cover the most important aspect of the suit, from an acting standpoint..the eyes ! 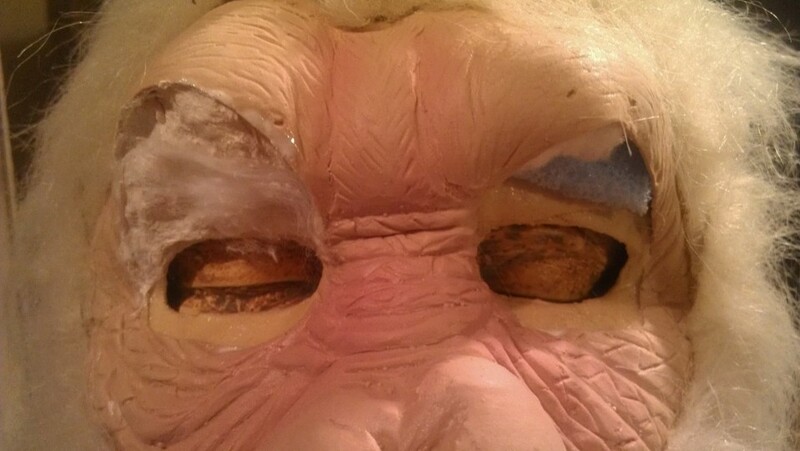 Most off the shelf masks have eyes, or eye holes that protruded a distance from the face of the wearer. 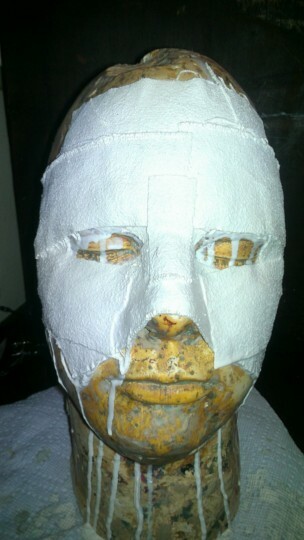 Our objective is to make the mask look like part of your face, rather than something that is just sitting loosely on your head. 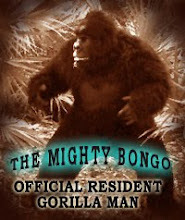 To begin, you need a gorilla mask ! 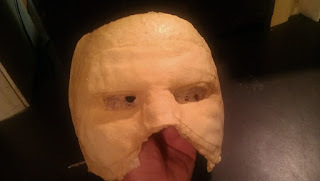 I recommend a mask that has a neutral expression with the mouth closed, or nearly so. You need a face form of some type , to do your build up work on.. 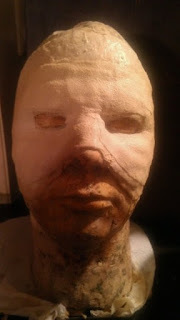 I've used an old life cast of my face in this demo, but you can also use a prefabricated head form. If you are unable to acquire a head form of some type, don't panic ! 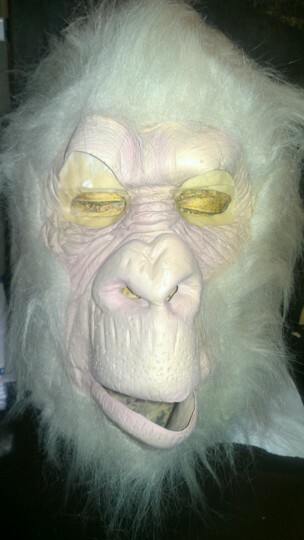 You can also use one of those inexpensive plastic masks from a craft store, (and) a Styrofoam wig head. a small piece of foam robber, or polyfoam. 12" square is plenty. First, stand in front of a mirror and put the mask on. Look closely at the eyes...do the eye holes fit snugly to you face ? Probably not. The mask I'm am using here is the worst possible scenario, just to show you how dramatic a change we can make with this technique. 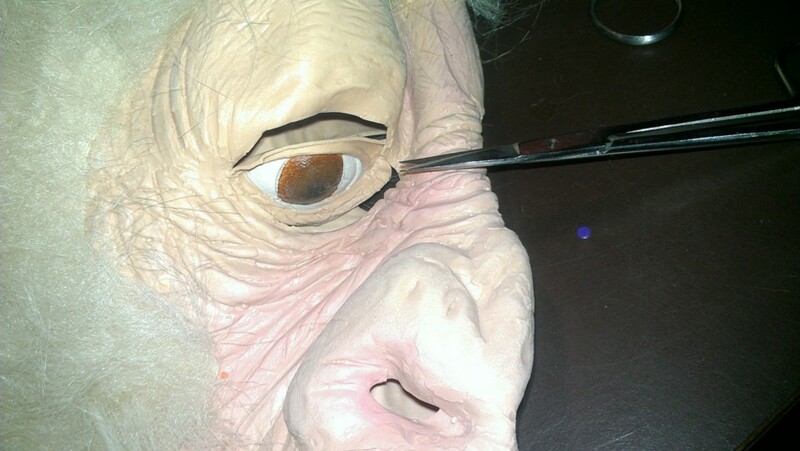 The Mask I'm using has molded on eyes ! 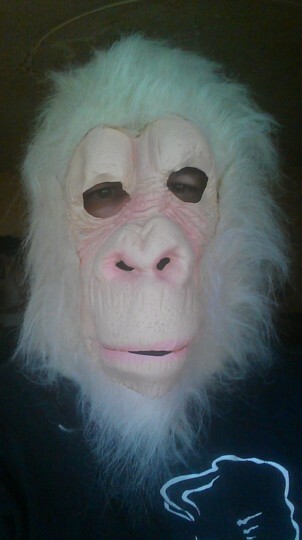 I forgot to get a close-up of the mask with the eyes still in place, so this is the same mas, but in black. 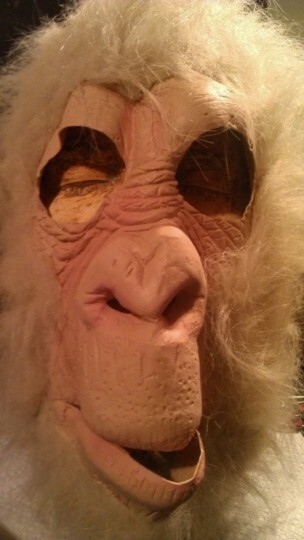 The face itself looks pretty good , but those molded on eyes have got to go! 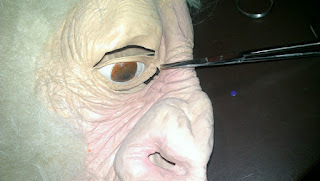 put the mask back on and check it again.If the mask has what looks like eyelids, they too have to go. Now set the mask aside and we'll start on the next step. We'll need your face form for this. Then take small strips and squares of canvas (or similar) fabric and dip them into liquid latex. Place these all around the eye area of the head form. Use a lot of layers, and overlap them as you go. Allow to dry. This will build up a thick, fairly rigid mask that will fit your eyes very snugly. 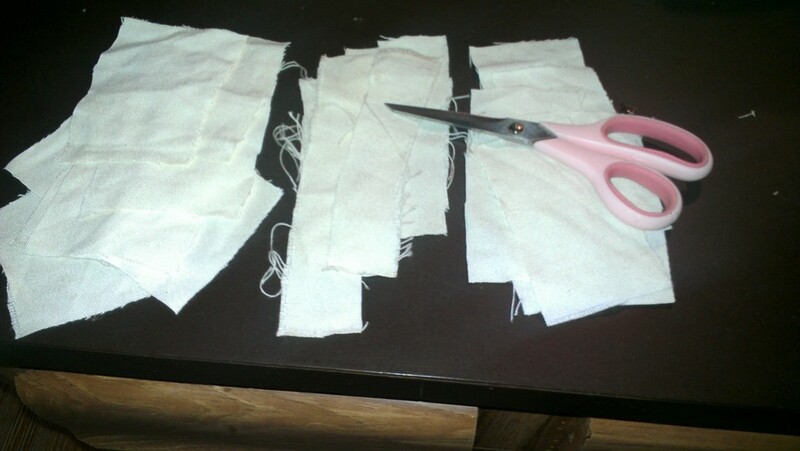 Trim this Eye mask to even it up all around, and trim out the opening for your eyes to look through. Test fit it to your own face, and adjust where necessary. 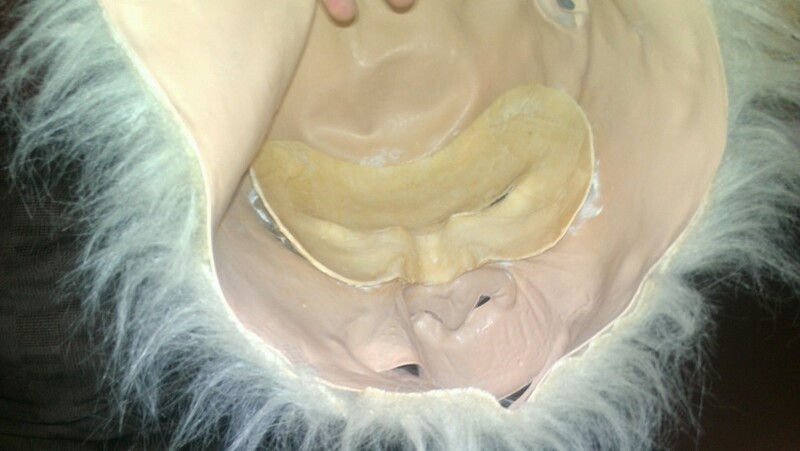 Once the fit to your eyes is good with this mini-mask, apply a coat of contact cement to the front of the eye mask, and to the inside of the eye area of the ape mask. 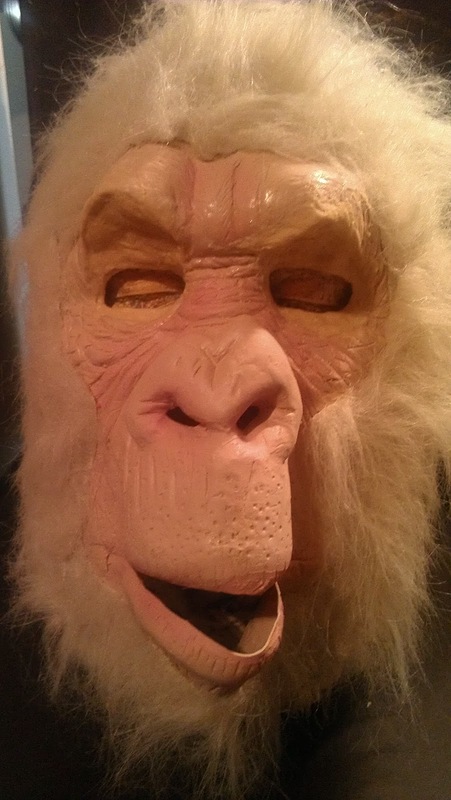 With the eye mask on the head form, carefully put the ape-mask onto the head form being careful to not touch the contact cemented surfaces together yet. 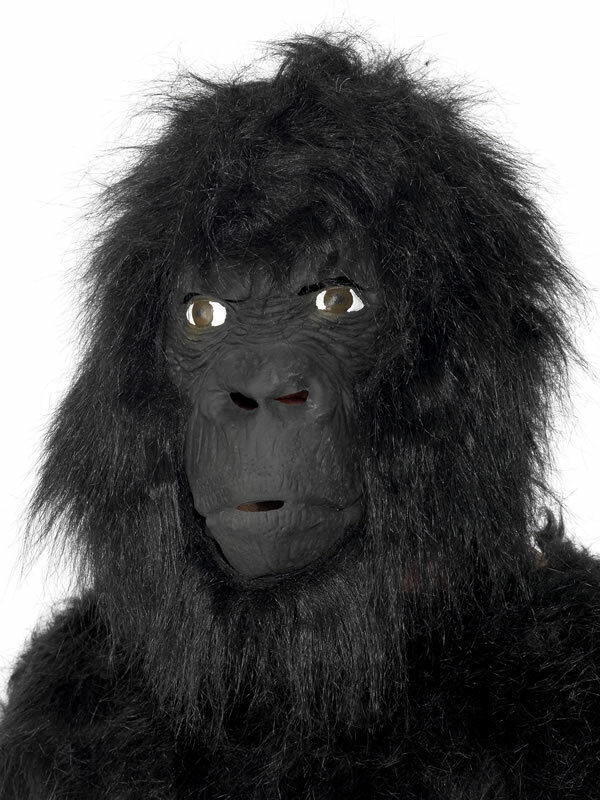 Line the eyes of the ape mask up with the new eye mask. Starting from the center of the nose between the eyes, gently press the ape mask down so it sticks to the new eye mask. Position the ape- face into a position that conforms to the eye plate and continue pressing down. 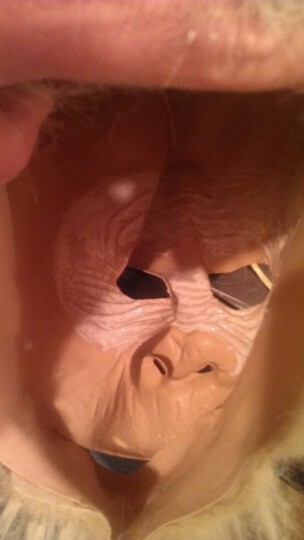 What all this does is to permanently glue the ape mask down to a inner mask that fits your face nearly exactly. 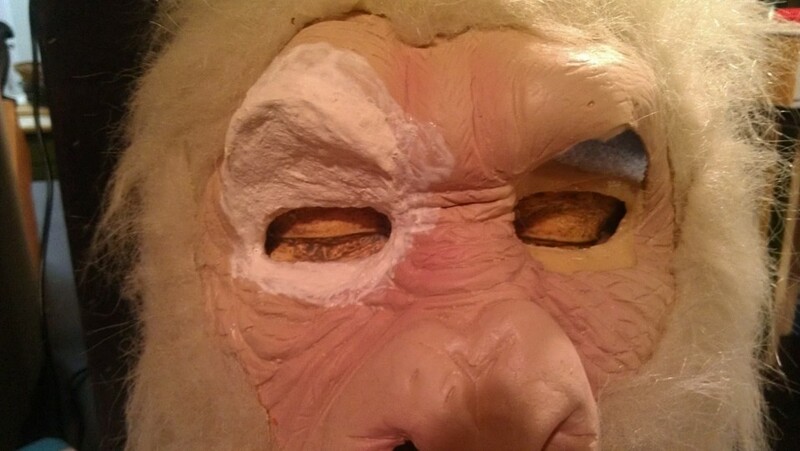 Once the masks are glued together, use scraps of foam rubber to "fill in" any voids or open areas. 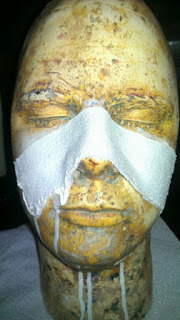 Then you can use liquid latex to laminate cotton down to the foam . Wet the foam first with the latex (use Q-tips for this). 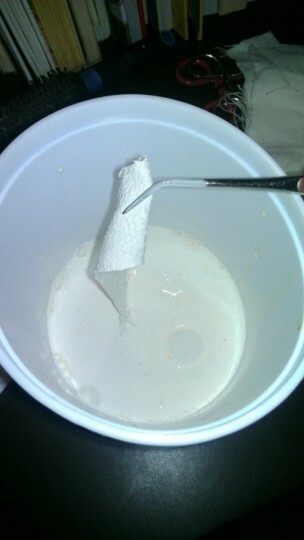 Then stretch the cotton out flat and tap it down to the foam. Using a rolling motion, wet the cotton from the center going out, re wetting frequently to keep the Q-tip from sticking. As a final step, you can mix a small amount of acrylic paint with liquid latex, and "stipple" this colored latex on the rebuilt area with a piece of the foam rubber. If all went well, you should now have a mask that fits your eyes very closely . Great post! I have to stop back and watch as your project progresses! Oh hoo..First i enter in your blog,i thought this is really a monkey after read fully your blog..Awesome ya..Have wonderful job with Liquid latex..have a great work re..Keep it up.. While I am LOVING Chris Walas's Build-Up... I really want to see where you were going with this. I'd love to dig out my childhood gorilla mask and spruce it up for old time's sake! Don't worry Chuck. After a break from Chris Walas's series we'll get this one rolling again ! Great ((easy)) instructions on ALL counts. Thank you: Chris Casteel !! 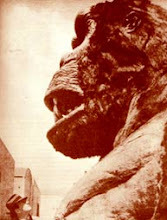 Chris Walas's Build-up Gorilla Bash !